For the photographer, see Seydou Keïta. Seydou Keïta (anglicised to Keita; born 16 January 1980) is a Malian former footballer. A versatile midfielder, he operated as both a central or defensive midfielder. He most notably played for Lens (five seasons) and Barcelona (four), winning 14 titles with the latter club after signing in 2008. He started his professional career with Marseille. Keita represented Mali since the age of 18, appearing in seven Africa Cup of Nations tournaments and winning 102 caps. He also held a French passport. Born in Bamako, Mali, Keita finished his football formation in France with Olympique de Marseille, joining the club at the age of 17. He played mainly for the reserve squad during his three-year spell. Keita made his Ligue 1 debut for L'OM on 19 September 1999 in a 1–0 home win against Troyes, adding three games in the season's UEFA Champions League. In the summer of 2000, he left the club. Keita signed for FC Lorient in Ligue 2, being instrumental (37 games, one goal) as the team promoted to the top level in 2001. He appeared slightly less due to injury in the following season, which ended in immediate relegation back, but brought the conquest of the Coupe de France, the club's first-ever (he played the full 90 minutes in the final against Bastia). In 2002, Keita joined fellow league side RC Lens, eventually becoming captain and scoring a career-best 11 goals in the 2006–07 campaign – his fifth and last – helping Les Sang et Or to the fifth position in the league and the last-16 in the UEFA Cup. On 11 July 2007, Keita signed a four-year contract with Sevilla FC for a €4 million transfer fee, plus a 10–15% capital gain for the club if it sold the player above €4 million. He appeared in both legs of that year's Supercopa de España, a 6–3 aggregate win against Real Madrid. Keita was an automatic first-choice for the Andalusians during the 2007–08 campaign, helping the team to the fifth position in the league. On 3 November 2007 he scored from long-distance in a 2–0 home win also against Real Madrid, and added three in nine games in the Champions League, including one against Arsenal in a 3–1 group stage home success which was the opposition's first loss of the campaign. Keita (middle) in action against Bayer Leverkusen. On 26 May 2008, Keita agreed to a four-year deal with FC Barcelona who paid his €14 million buy-out clause (making Lens eligible to receive €1.3 million from Sevilla). He became the first Malian player to ever represent the Catalans, and his new release clause was set at €90 million. 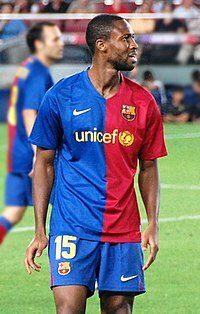 Keita made his official debut for Barcelona in a Champions League qualifier against Poland's Wisła Kraków on 13 August 2008, a 4–0 home win. He made his league debut against CD Numancia on the 31st, coming on as a substitute for Andrés Iniesta midway through the second half of a 0–1 away loss. Keita scored his first goal for the team on 16 November 2008, in a 2–0 win at Recreativo de Huelva. The following week he added another, in a 1–1 home draw against Getafe CF; he finished his first season at the Camp Nou with 46 official games as Barça won the treble. He played 20 minutes in the Champions League final, taking the place of Thierry Henry in the 2–0 win against Manchester United. On 25 October 2009, Keita scored his first career hat-trick, in a 6–1 home win against Real Zaragoza, and contributed with 29 games – 23 starts – as Barcelona renewed its domestic supremacy. In the 2010–11 campaign he made more appearances than any other outfield player and, on 31 August, aged 31, signed a contract extension that would link him to the club until 2014. On 7 July 2012, Keita announced he would be leaving Barcelona after four seasons, invoking a clause in his contract allowing him to leave the club even though he still had two years left. The following day, he signed a two-and-a-half-year deal with Chinese Super League side Dalian Aerbin FC, being reportedly paid €14 million per year. Keita playing for Roma in 2014. On 30 January 2014, Keita returned to Spain after signing with Valencia CF, with the 34-year-old agreeing to a six-month contract with the option for an additional year. He made his debut for the Che on 16 February, replacing Paco Alcácer for the last 20 minutes of a 0–0 away draw against former club Sevilla. On 13 March, midway through the first half of an away fixture against Ludogorets Razgrad for the UEFA Europa League, he was sent off for a challenge on Roman Bezjak that resulted in a penalty kick, but his team eventually won it 3–0 and 4–0 on aggregate. On 27 March 2014, Keita scored Valencia's fastest-ever goal, netting after nine seconds at Almería. He also had to leave before the end of the first half with an injury, as the hosts came from behind for a 2–2 draw. On 5 June 2014, Keita signed a one-year contract with Serie A club A.S. Roma. He made his official debut in the opening day of the season, against Fiorentina (2–0 win), and scored his first goal on 9 November to help defeat Torino 3–0 also at the Stadio Olimpico. Keita agreed to a new one-year deal in the 2015 off-season. Keita ended his career at Qatari club El Jaish. Keita (#12, middle) lining up for Mali in 2008. Keita made his debut for Mali on 9 April 2000, in a 2002 FIFA World Cup qualifier against Libya. He represented the country in six Africa Cup of Nations tournaments: in the 2010 edition in Angola he scored twice, both goals coming in the 4–4 group stage draw against the hosts, who were leading 4–0 with 11 minutes to go; Les Aigles, however, could not make it past the group stage. Keita also participated in the 2013 Africa Cup of Nations in South Africa, scoring in the 1–1 quarterfinal draw against the hosts as Mali eventually won the shootout. Previously, he helped the under-20s finish third at the 1999 FIFA World Youth Championship in Nigeria, scoring in the last match against Uruguay – the game's only– and being named the tournament's best player. Keita's uncle, Salif Keïta, was also a footballer. He played, amongst others, for Valencia CF and Sporting Clube de Portugal, and was once voted African Footballer of the Year. Keita married Zubaida Johnson, of Cape Verdean descent. On 12 May 2008, he became the father of a son, Mohammed, who was born in Seville. ^ "FIFA Club World Cup UAE 2009 presented by Toyota: List of players" (PDF). FIFA. 1 December 2009. p. 1. Retrieved 27 March 2014. ^ "Seydou Keïta – Century of International Appearances". RSSSF. Retrieved 25 October 2017. ^ "Bastia 0–1 Lorient". L'Équipe (in French). 11 May 2002. Retrieved 28 July 2016. ^ "El Sevilla ficha al centrocampista Keita" [Sevilla signs midfielder Keita] (in Spanish). Merca Fútbol. 11 July 2007. Retrieved 31 October 2011. ^ a b "Arbitration CAS 2010/A/2098 Sevilla FC v. RC Lens, award of 29 November 2010" (PDF). Court of Arbitration for Sport. 29 November 2010. Retrieved 5 July 2017. ^ "Barcelona 2–0 Man Utd". BBC Sport. 27 May 2009. Retrieved 7 June 2018. ^ "All square at Sevilla". ESPN FC. 16 February 2014. Archived from the original on 9 March 2014. Retrieved 28 March 2014. ^ "Valencia cruise past Ludogrets". ESPN FC. 13 March 2014. Archived from the original on 19 March 2014. Retrieved 28 March 2014. ^ "Keita entra en el podio de los goles más rápidos de la Liga" [Keita joins League's fastest goals podium]. Marca (in Spanish). 27 March 2014. Retrieved 28 March 2014. ^ "Otro acto de fe en Almería" [Another act of faith in Almería]. Marca (in Spanish). 27 March 2014. Retrieved 28 March 2014. ^ "Seydou Ahmed Keita". A.S. Roma. 5 June 2014. Retrieved 6 June 2014. ^ "Roma cruise to easy victory at home to Torino". ESPN FC. 9 November 2014. Retrieved 9 November 2014. ^ "Club statement: Seydou Keita". A.S. Roma. 14 July 2015. Retrieved 18 July 2015. ^ Olasoji, Tolu (4 April 2018). "Keita: Barcelona must respect AS Roma". Goal. Retrieved 1 February 2019. ^ "Match report: Libya – Mali". FIFA. 9 April 2000. Archived from the original on 5 February 2013. Retrieved 20 January 2013. ^ "South Africa 1–1 Mali". BBC Sport. 2 February 2013. Retrieved 5 February 2013. ^ "Seydou Keita se ha forjado un nombre" [Seydou Keita has made a name for himself] (in Spanish). FIFA. 30 November 2007. Retrieved 31 October 2011. ^ "S. Kéita". Soccerway. Retrieved 23 June 2014. Wikimedia Commons has media related to Seydou Keita.